Fearless Frederick Video Slot Review - Casino Answers! Fearless Frederick is a 5-reel, 30-line video slot developed by Microgaming, featuring a wild symbol, scatter wins, multipliers, a free spins feature, a gamble feature and a bonus game. You can play the Fearless Frederick video slot at Bovada. The Fearless Frederick casino game is a penny slot machine. Coin values on the Fearless Frederick slot machine are $0.01, $0.02, $0.05, $0.10 and $0.20. You can select 1-30 paylines at 1-10 coins per line, making for a maximum total bet of $60 per spin. 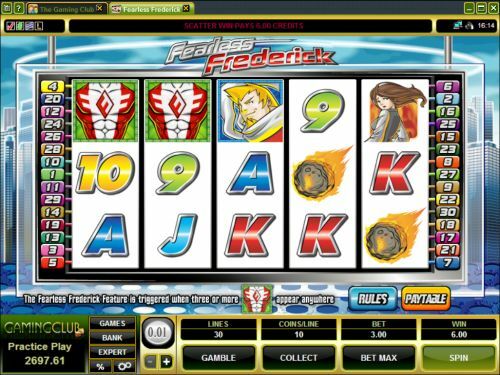 The Fearless Frederick online slot has a decent betting range that should suit most casual players and high rollers. To play the Fearless Frederick video slot, select your bet and hit “Spin.” To play all 30 lines at 10 coins per line, use the “Bet Max” button to spin the reels. The highest paying symbol on the Fearless Frederick slot game is the Frederick symbol. If 5 Frederick symbols appear on a selected payline, you will win the 7000 coin top jackpot. The Frederick symbol is a wild multiplier, so it can substitute for all other symbols in the game except for the Superhero Suit symbol. When it substitutes in a winning combination, your prize will be doubled. Other high paying symbols on the Fearless Frederick video slot include the Sidekick (2000 coins) and Car (1000 coins). You can gamble your winnings on the Fearless Frederick online slot by hitting the “Gamble” button following any win. Hit “Red” or “Black” to guess the card’s colour to double your winnings if correct. Guess the card’s suit correctly and you will quadruple your win. Exit the gamble feature at any time by hitting the “Collect” button. If you’re not satisfied with your winnings, you can always win more using the gamble feature on Fearless Frederick at Bovada! Payouts are made according to the Paytable. Payline wins are multiplied by the bet per line. Scatter wins are multiplied by the total bet. Scatter wins are added to payline wins. All symbols pay left to right, except for the scatter symbol (which pays any). Highest win only on each selected payline. Coinciding wins on different selected paylines are added. The Frederick symbol will substitute for all symbols except for the scatter symbol. Prize is doubled when the Frederick wild multiplier symbol substitutes in a winning combination. Fearless Frederick has an autoplay feature with advanced settings. To use the autoplay mode on the Fearless Frederick online slot machine, you must hit the “Expert” button. You can now play 5 or 10 autoplay spins. For advanced settings, hit the “AutoPlay” button and you can now play 5, 10, 25, 50, 100, 250 or 500 autoplay spins and stop autoplay if a win exceeds or equals $100, $500, $1000, $5000 or $9999. Autoplay will stop on any feature contained in the game. You can stop autoplay at any time on the Fearless Frederick slot game. 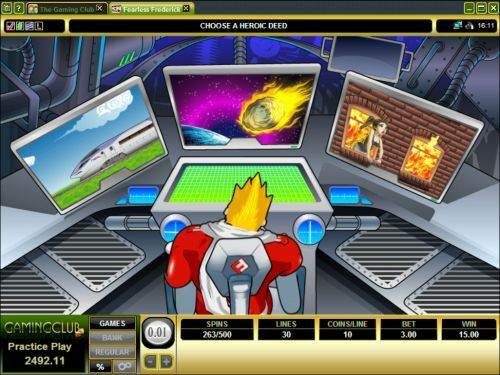 For those who like comic books or sci-fi, you will enjoy the Fearless Frederick superhero slot. The Fearless Frederick video slot offers good payouts, free spins, a bonus game and even a gamble feature. You can play the Fearless Frederick slot game, sign up and make a deposit today at Bovada. Can USA residents play the Fearless Frederick video slot for real money? American players cannot play the Fearless Frederick slot game for real money. For a great selection of USA-friendly online slots, please check out Win A Day Casino. You can find all of the sci-fi slot reviews you need by reading out list of science fiction slots.